Tom Thomson (1877–1917), Spring (1914), oil on canvas on wood, 22.2 x 26.7 cm, McMichael Canadian Art Collection, Kleinburg, ON. The Athenaeum. Almost a century ago, on 8 July 1917, one of North America’s most promising young landscape painters disappeared when he was canoeing on Canoe Lake in Algonquin Park, Ontario. Tom Thomson was last seen leaving Fraser’s Dock to paddle to Tea Lake Dam or West lake, after 1230. His body was discovered eight days later, drowned in the lake which he had paddled in and had painted so often. He was just a month short of his fortieth birthday. In this and the following articles, I will commemorate his death by looking briefly through his life, and his unique paintings. Thomson was brought up in Leith, Ontario, on the south shore of Georgian Bay, Lake Huron, being born in 1877. When he was twenty-one, he started an apprenticeship in a local machine shop, but was soon fired for his poor timekeeping. He also volunteered for the Second Boer War, but was turned down because of his flat feet. For eight months he studied at a business college, then went to join his older brother in Seattle. He returned to Canada, settling in Toronto in the summer of 1905, where he worked for a photo-engraving firm. Although Thomson seems to have learned calligraphy and perhaps some elements of graphic design when he was in Seattle, it is thought that his first formal training in painting was in evening classes in Toronto which were taught by William Cruikshank (1848-1922), who had been trained in the academic tradition. Tom Thomson (1877–1917), Design for a Stained-Glass Window (c 1905-07), graphite, pen and ink and watercolor on wove paper, 34.2 x 17.1 cm, Art Gallery of Ontario, Toronto, ON. The Athenaeum. A few examples of Thomson’s work from these early years have survived, including this design for a stained-glass window from about 1905-07, which he made in pencil, ink and watercolor. In the winter of 1908-9, he moved to work in a graphic design firm; there the senior artist encouraged staff to paint outdoors in their spare time. Thomson started to meet regularly with artists who were to form the Group of Seven, including Arthur Lismer, Fred Varley, Franklin Carmichael, and Lawren Harris (who was later so influential on Emily Carr). In the Spring of 1912, Thomson and a friend from work undertook a canoe trip in Algonquin Park, a large forested area about two hundred miles to the north-east of Toronto. Thomson bought a plein air oil painting kit, and started to make his first plein air oil sketches there. Tom Thomson (1877–1917), The Canoe (1912), oil on canvas, 17.3 x 25.3 cm, Art Gallery of Ontario, Toronto, ON. The Athenaeum. 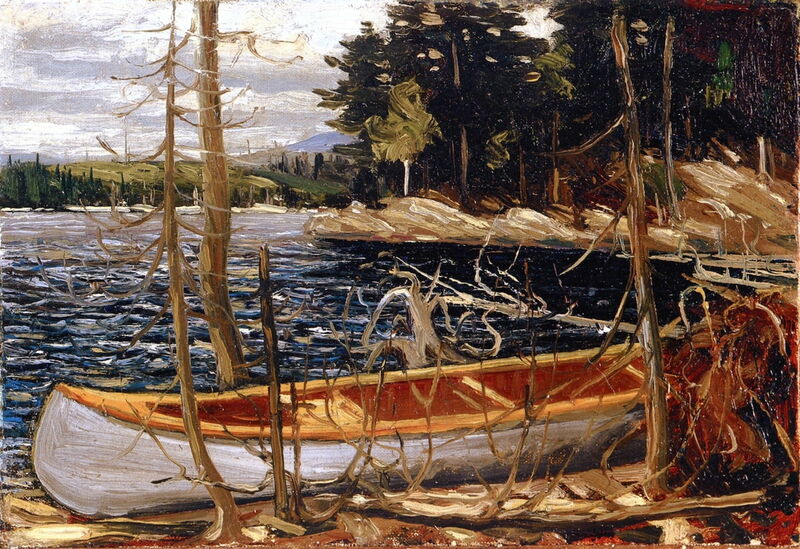 Thomson’s initial oil paintings from that period are quite meticulously realist, even sketches such as The Canoe (1912). He was to become very familiar with paddling in open canoes like this one over the following years. 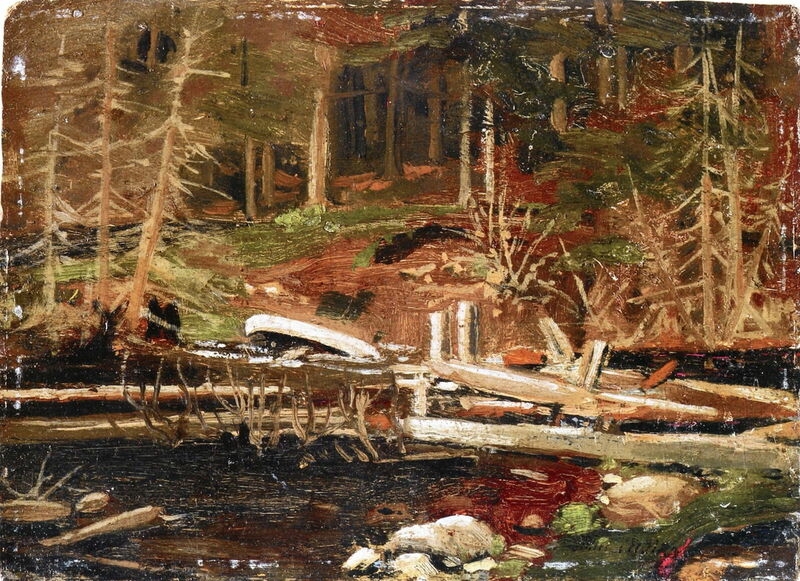 Tom Thomson (1877–1917), Old Lumber Dam, Algonquin Park (1912), oil on paperboard, 15.5 x 21.3 cm, National Gallery of Canada / Musée des beaux-arts du Canada, Ottawa, ON. The Athenaeum. Old Lumber Dam, Algonquin Park (1912) shows another scene from this first canoeing and painting trip. In the autumn/fall of 1912, Thomson went on an even more ambitious canoe trip, with another friend from work, this time over a period of two months. They explored the wild country north of Manitoulin Island and Georgian Bay. 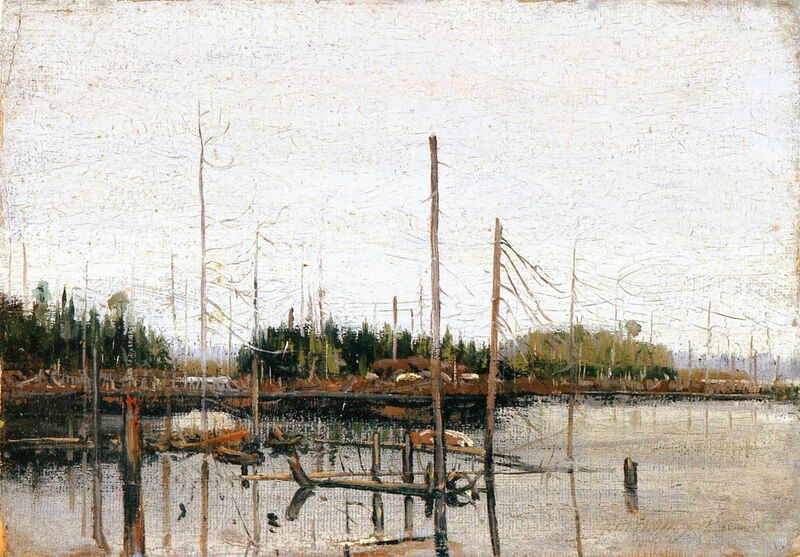 Tom Thomson (1877–1917), Drowned Land (1912), oil on paper on plywood, 17.5 x 25.1 cm, Art Gallery of Ontario, Toronto, ON. The Athenaeum. Drowned Land (1912) shows a flooded area of meadow and wood produced when beavers or loggers dammed a creek. Notable for its composition and precision, it is probably his first major painting, although it lacks the brilliant colours which were soon to become such a feature of his work. Tom Thomson (1877–1917), View over a Lake: Shore with Houses (1912-13), oil on paper on plywood, 17.9 x 25.8 cm, National Gallery of Canada / Musée des beaux-arts du Canada, Ottawa, ON. The Athenaeum. View over a Lake: Shore with Houses (1912-13) must have been painted earlier in the year, before the marked change in colour to that of the autumn. Tom Thomson (1877–1917), Autumn, Algonquin Park (1912-13), oil on cardboard on paperboard, 17.8 x 25.2 cm, Private collection. The Athenaeum. 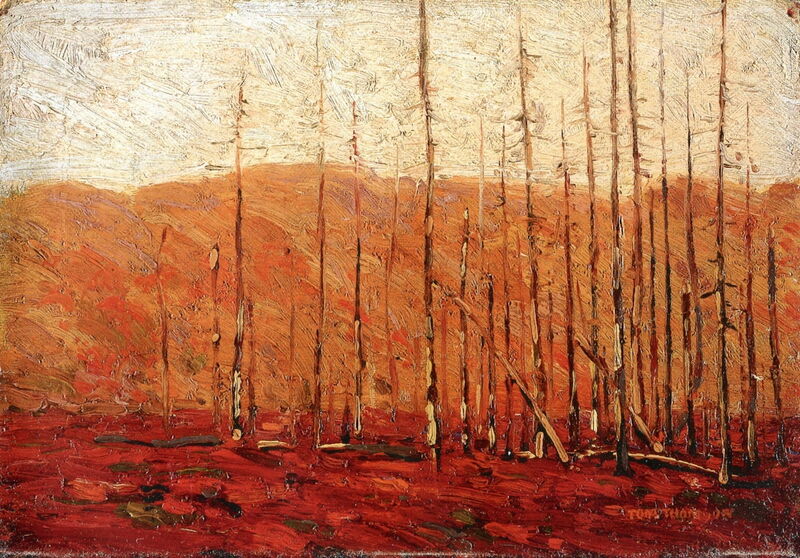 Autumn, Algonquin Park (1912-13) is one of his first oil sketches of the dazzling colours of the autumn/fall in this part of Canada. 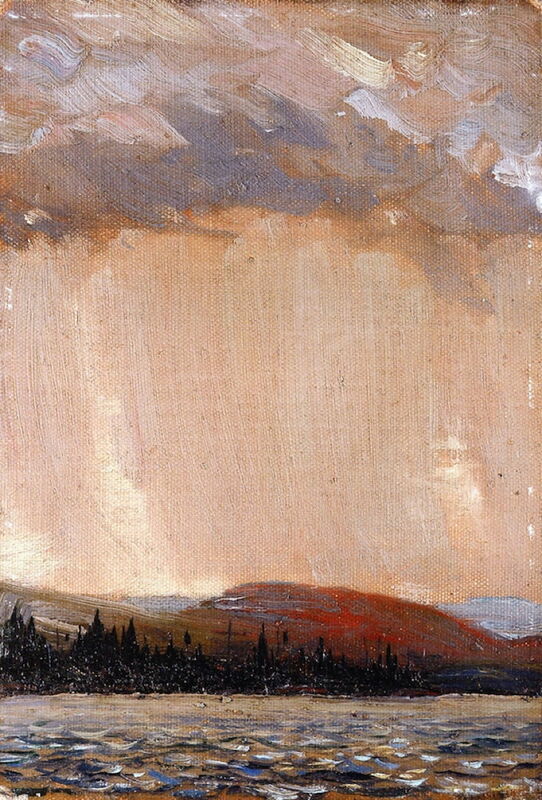 Tom Thomson (1877–1917), Thunderhead (1912-13), oil on canvasboard, 17.5 x 25.2 cm, National Gallery of Canada / Musée des beaux-arts du Canada, Ottawa, ON. The Athenaeum. 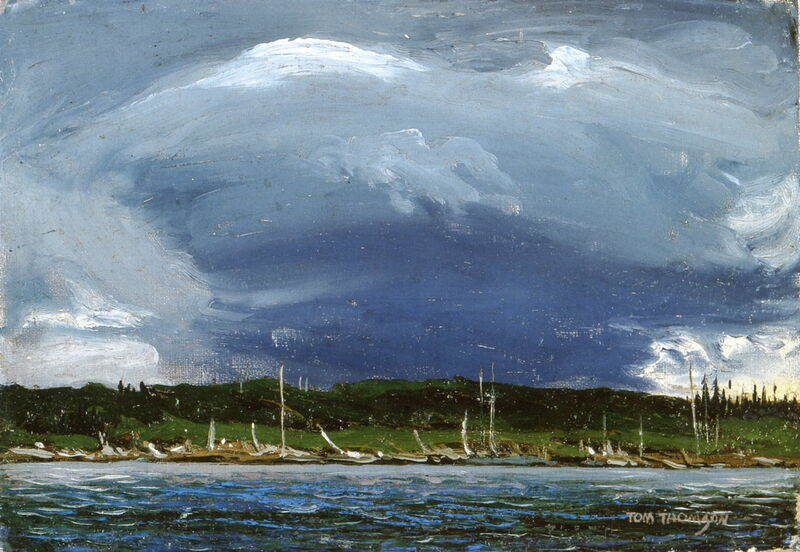 Thunderhead (1912-13) shows a passing thunderstorm. Tom Thomson (1877–1917), Northern Lake (1912-13), oil on canvas, 71.7 x 102.4 cm, Art Gallery of Ontario, Toronto, ON. The Athenaeum. 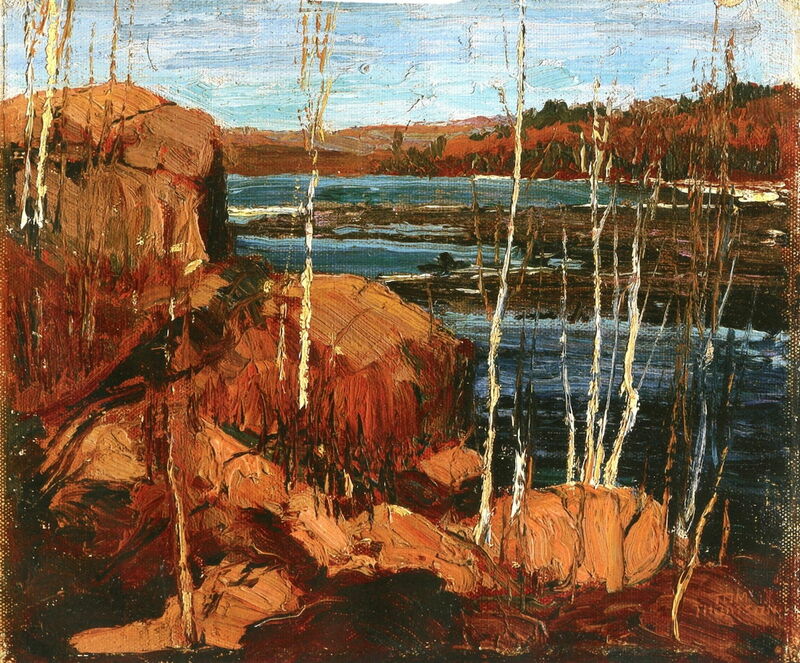 Northern Lake (1912-13) is one of Thomson’s first paintings on a larger canvas, and in 1913 it was sold for $250 to the Ontario government. Although not a great deal in terms of income, this was sufficient to encourage him to leave his job as a designer in Toronto in 1913, and to start establishing himself as a full-time artist. 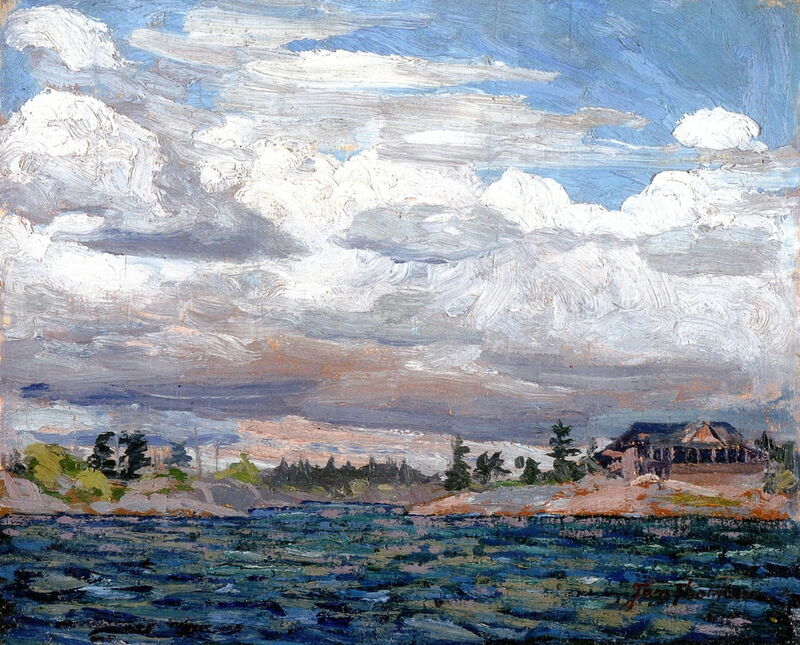 He exhibited his work for the first time with the Ontario Society of Artists, which he continued to do until he died. Tom Thomson (1877–1917), Canoe Lake (1913), oil on canvas on paperboard, 25.2 x 17.2 cm, National Gallery of Canada / Musée des beaux-arts du Canada, Ottawa, ON. The Athenaeum. 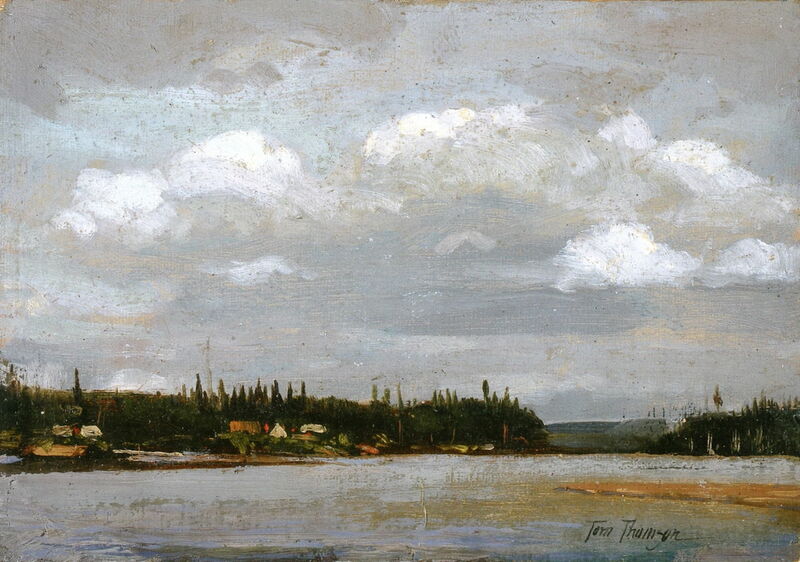 In Canoe Lake (1913), Thomson experiments with thinner application of paint, particularly for the rain showers falling from the clouds. 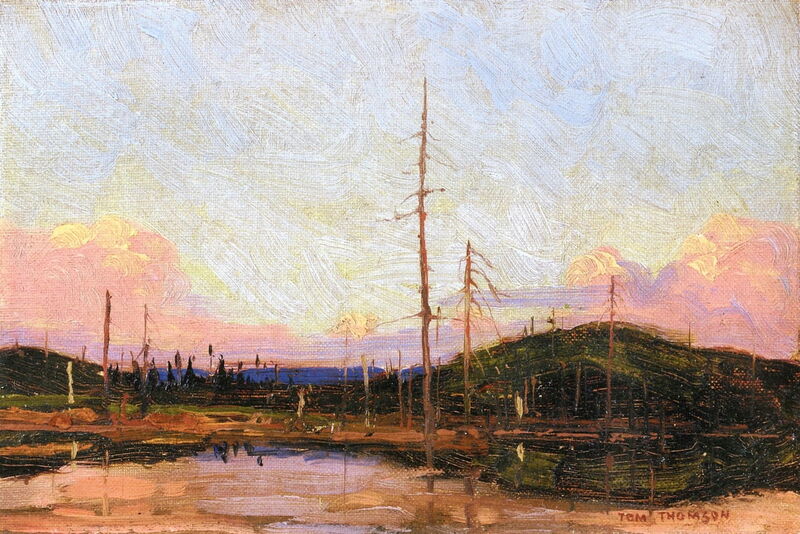 Tom Thomson (1877–1917), Evening (1913), oil on cardboard on paperboard, 16.6 x 24.7 cm, Art Gallery of Ontario, Toronto, ON. The Athenaeum. In his Evening (1913), Thomson started to develop his use of bolder colour, although his composition remains quite simple still. His turning point came in 1914, when the National Gallery of Canada started buying his paintings, which was unusual for such an inexperienced artist. Despite this he still needed to augment his income with short periods of employment, when he worked in various jobs in Algonquin Park. His career and art were greatly helped by the patronage of a Toronto professor of ophthalmology, James MacCallum, who covered Thomson’s expenses for a year. Thomson’s studio was a renovated shack in the grounds behind a small block of six studios in Rosedale, Toronto (The Studio Building, 25 Severn Street), which was completed in 1914 thanks to funds from Lawren Harris and Professor MacCallum. In 1914, Thomson spent April-May in Algonquin Park, June-July in Georgian Bay exploring the area around Professor MacCallum’s cottage, and he returned to Algonquin Park for August-November. During the latter period, he was joined by Arthur Lismer, A Y Jackson, and Fred Varley. Spring (1914) is more typical of Thomson’s early mature style, with its strong colour and loose facture. 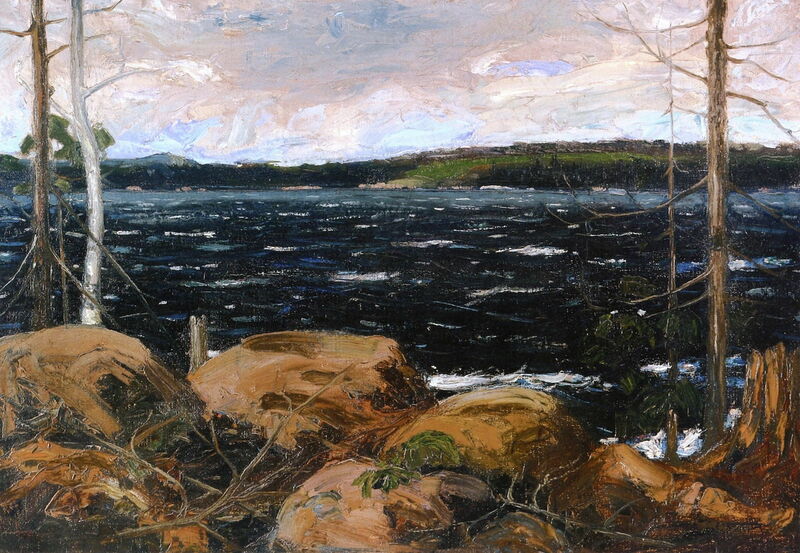 Tom Thomson (1877–1917), Cottage on a Rocky Shore (1914), oil on wood, 21.6 x 26.7 cm, National Gallery of Canada / Musée des beaux-arts du Canada, Ottawa, ON. The Athenaeum. I wonder whether Thomson’s Cottage on a Rocky Shore (1914) was that owned by Professor MacCallum, which he used as his base for the summer. Tom Thomson (1877–1917), Canoe Lake, Mowat Lodge (1914), oil on plywood, 21.4 x 26.7 cm, Tom Thomson Art Gallery, Owen Sound, ON. The Athenaeum. Canoe Lake, Mowat Lodge (1914) shows one of the many lodges in Algonquin Park, built to cater for tourists who travelled there by rail. It was often used by Thomson as his operating base when he was in the park. 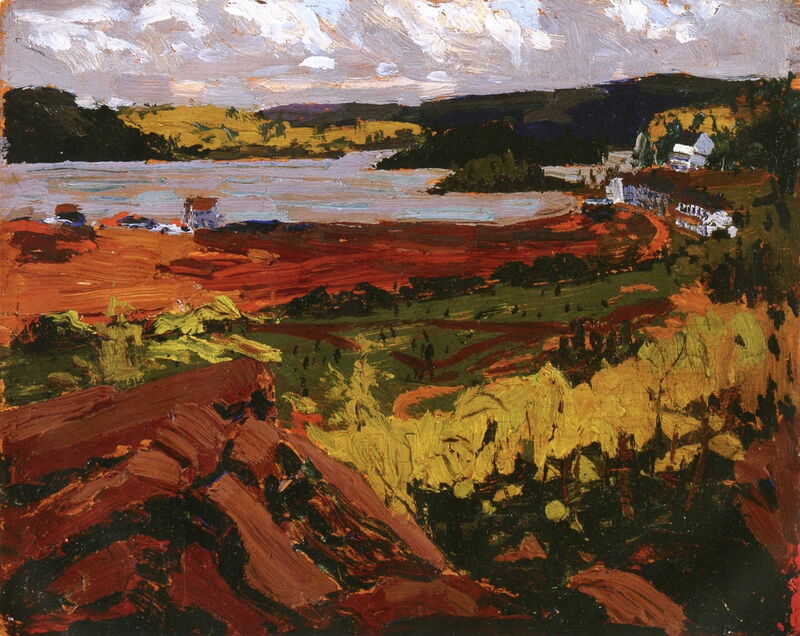 Tom Thomson (1877–1917), The Hill in Autumn (1914), oil on composite wood-pulp board, 21.5 x 26.7 cm, National Gallery of Canada / Musée des beaux-arts du Canada, Ottawa, ON. The Athenaeum. 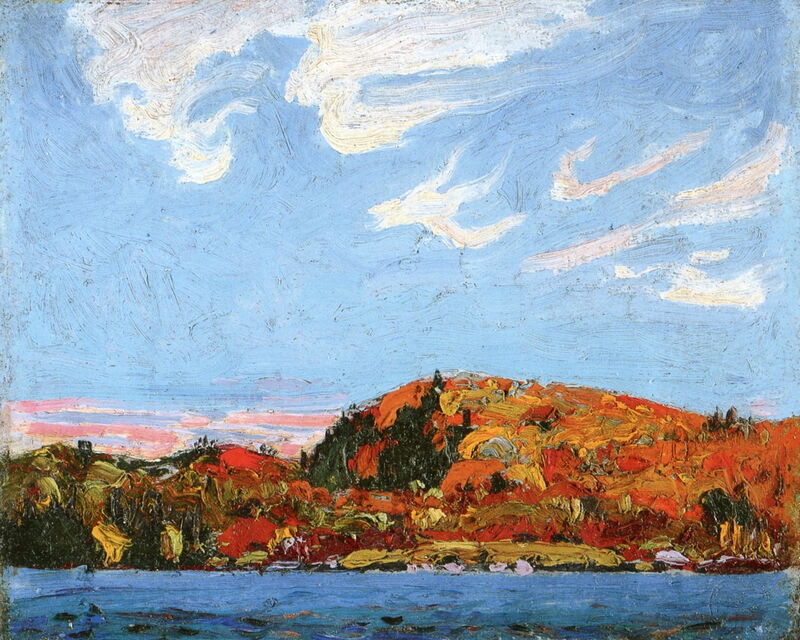 The Hill in Autumn (1914) shows a fine autumn day in Algonquin Park with its rich patchwork of colours. Tom Thomson (1877–1917), The Brook (1914), oil on canvas on paperboard, 22.4 x 27 cm, National Gallery of Canada / Musée des beaux-arts du Canada, Ottawa, ON. The Athenaeum. 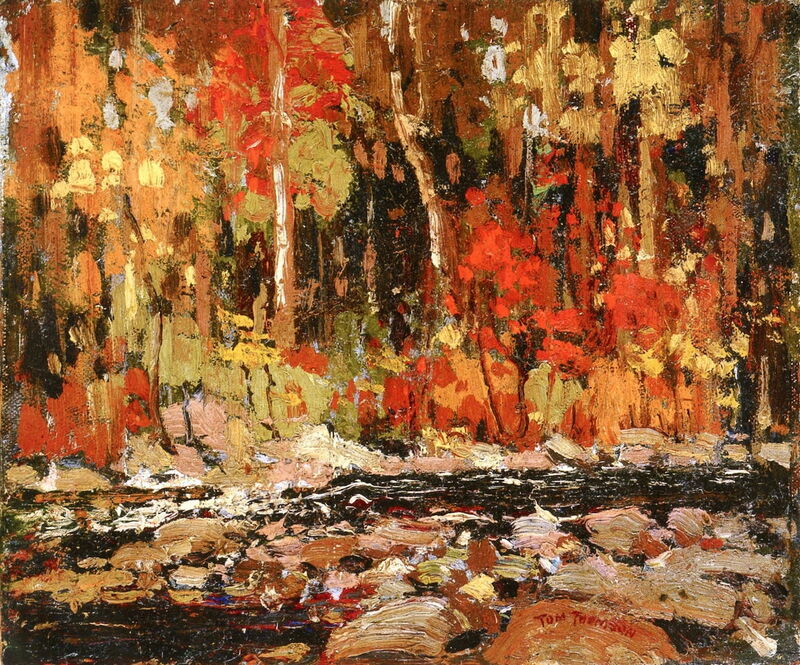 The Brook (1914) is another painting from Thomson’s autumn campaign in Algonquin Park. At the end of the year, Thomson moved into his studio shack behind the Studio Building in Toronto, to live and work through the winter months, and to prepare himself for the next spring campaign. Posted in General, Painting and tagged Canada, Group of Seven, Harris, landscape, painting, Thomson. Bookmark the permalink.